Every person is motivated. The challenge is to create a work environment in which people are motivated about work priorities. Too often, organizations fail to pay attention to the employee empowerment, employee recognition, communication, and involvement issues that are most important to the employees. The first step in creating a motivating work environment is to stop taking actions that are guaranteed to deflate people. 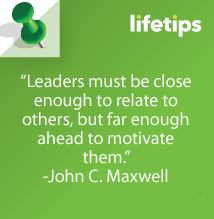 Identify and take actions that will motivate them. It’s a balancing act. Employers walk a fine line between meeting the needs of the organization and its customers and meeting the needs of its internal staff. Do both well and thrive! The key to finding out what issues are most important to the employees is to ask them. Conduct anonymous surveys that encourage employees to share their true opinions. These surveys can be used to determine what issues are valued by the employees. Once the employer understands what issues need improvement, they can work to formulate a plan for implementing changes that will highlight these issues. Motivation helps people achieve goals, gain a positive perspective, create the power to change, build self-esteem and capability, manage their own development and help others with theirs. There are no real disadvantages to successfully motivating employees, but there are many barriers to overcome. Barriers may include unaware or absent managers, inadequate buildings, outdated equipment, and entrenched attitudes such as: We don’t get paid extra to work harder” or “We’ve always done it this way.” Such views will take persuasion, perseverance, and the proof of experience to break down. Commercial success depends on employees using their full talents, yet managers often view motivation as something of a mystery. Individuals are motivated by different things and in different ways. In addition, the flattening of hierarchies can create insecurity and lower staff morale. Employee morale lowers when employees feel as though their efforts are not being appreciated. Morale also takes a dip when employees feel in the dark about important company issues. Taking the time to acknowledge the efforts of employees and keeping them informed of company issues can prevent morale from taking a plunge. Employers want to maximize their profits and the way that they do this is by motivating their employees to succeed. Successful companies know that hard working and effective employees are their most valuable asset. Guidelines are necessary for employee motivation. Make a minimum number of rules and policies to protect your organization legally and create order. Publish the rules and policies and educate all employees. Let many employees join management in identifying organizational values; write value statements and a professional code of conduct. Develop guidelines for supervisors and educate them about the fair and consistent application of the few rules and policies. Address individual dysfunctional behaviors on a “need-to” basis with counseling, progressive discipline, and performance improvement plans. Clearly communicate work place expectations and guidelines for professional behavior. Finally, do not just discipline undesirable behaviors but be sure to also seek out ways to acknowledge desirable behaviors. Creating employee recognition programs will motivate employees to strive to do their best in the workplace. During another amazing yoga class this week, the Sage brought a unique message to class: the mess in your message. It is your actions that deliver your message – and at times, the mess is in the message. The mess shown may be an integrity issue, like what is happening with the CEO of Exxon. The CEO of Exxon is in a mess right now. One of his competitors is fracking (a term used for the controversial technology of resource extraction from the ground) and building a water tower near his home. Exxon does a lot of fracking around other people’s homes. As the CEO, one would think if it were okay in one place, it would be okay everywhere. However, he is suing to stop the fracking around his home, taking the competitor to court. His action shows a conflict in his integrity – what a mess. And what a strong message. Where is the mess in your message? Where does controversy live in your life? The beautiful thing about the mess is it sends a clear message – even if you don’t realize it. Out of the mess, a solution can arise. Ask for help from a trusted friend or coach to clarify the mess and shift your message. Our actions create a story, and are the result of a story. Our stories emerge as a result of past actions and experiences. Current actions are generated from the thoughts and emotions based upon what has happened to us. This creates our experience of life, as well as our current circumstances. Our fellow human being, the CEO of Exxon, had an opportunity to do something for the greater good. He is making a statement about a process that obviously is not in the best interest of humanity. He could have chosen to impact the problem and create a solution. However, he is choosing to exacerbate the problem based upon a serious integrity issue. He is also making a powerful statement about this fracking process: not in my backyard. If not in his, why in anyone else’s? This week, look at any ‘messes’ in your life. Are your actions amplifying or clarifying your mess? Becoming aware of the mess in your message is a critical step in creating an amazing life. Through awareness comes choice. Fear is a measurement tool. Fear means you’re leaving the old reality behind. Fear is a gift that indicates you are closer to your dream. Fear is a healthy, natural mechanism, a sign of vitality and that you are in process. Unless you learn to use fear as empowerment, it can also stop your progress. Be more specific. What exactly is scaring you? The more clarity you have, the easier it will be to get the support you need to move through your fear. Understanding your fears is the key to conquering them. The number one way to sabotage your dream is by projecting your fears, doubts and concerns into it. Fear and doubt do not belong in your dream. Fear is part of your reality. Deal with fear by clarifying it, designing a strategy for managing it and by asking for help and support. Are you more committed to your dream or to your reality? Do you believe in your positive beliefs or your old limiting beliefs? The answer is in the action you take. Every day do at least one thing to move your dream forward. Success is guaranteed! Think of three times in your life when passion ruled. Were you learning, teaching, taking risk, being creative, problem solving, helping others, having fun? What were you passionate about in all three memories? Find the common thread then put your dreams to work. Your passion does not have to be an area where you have had the most success, but it should be where you have enjoyed yourself the most. Success follows passion when you nurture the passion. When we are in touch with our passion we have more energy, enthusiasm and creativity. 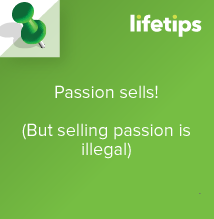 In a business context, passion sells. If you are starting a business, or you are trying to find the next step in your career, stop and think about what excites you and what invigorates you. If you are an employer and you want to grow your business and your company, remember that passion and creativity go hand in hand with productivity. Happy people make happy employees and happy employees go the extra mile, producing greater results. Turn passion into profit by doing what has meaning for you. The money will follow. Articulate your vision with clarity so people understand what it is, and with passion so others want to join you. Passion is contagious and inspirational, helping you sell your ideas or products to others. 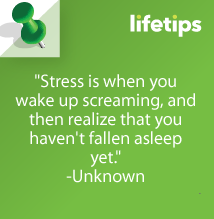 People frequently sabotage themselves by putting their attitudes, beliefs or fears into their dreams. If you’re putting your concerns into your dreams, your fears will become bigger and seem more real as you move closer to getting what you want. Your concerns don’t belong in your dream. They’re part of where you are now, not where you’re going. To make your dream successful, keep the fear that you won’t have time for friends and family in the “Where I Am Now” column. Assume for the “Where I Want To Be” column that you’ll have all the time you desire to enjoy your success, your friends and your family after achieving the dream. Because we view change as filled with murky unknowns, fear may feel like death. However, the experience is actually the old you dying away and allowing the new transformed you to breath. This is good news. By trusting what you want, often you will be able to release the part of you that was afraid of making your dream come true. By shedding the pieces that no longer fit, you can create a new dream to move toward. You lose your fear of change when your dream begins to take on life as you envision it, speak about it and act on it with passion. As you open yourself up to unlimited possibilities, fear fades and you begin to make progress. Follow through on your dream commitment: walk your talk. Articulating your dream with clarity and passion, gets others excited about it and invite their support. Dream big, share your dream and remind others to do the same. Being on top ain’t always easy, huh? There’s a fine like between being respected and being feared, between being personable and being a push over, between being firm and being a b*tch. How do you walk that line perfectly every day? In my opinion, you don’t. Being the leader of a company does not require super human skills, it just requires confidence in yourself, faith in your team and the ability to make mistakes gracefully. Perhaps you remember that kid (or you were that kid) on the playground that everybody disliked for being “bossy”? That kid probably had great ideas, but just shouted out orders and spoke down to his peers. That kid was never able to recruit more than a couple kids to join his cause. Now think of the playground hero. The kid who could rally a bunch of different kids in different cliques in different grades into playing a huge playground-wide game of capture the flag. The kid who could unite a huge group of his peers to petition their teachers for 10 extra minutes of recess. That kid was a leader. That kid got everybody else excited about his cause, and made them want to be apart of it. And if that still doesn’t work you can threaten to mail them somewhere. And you could have made good on that threat up until June 13, 1920. 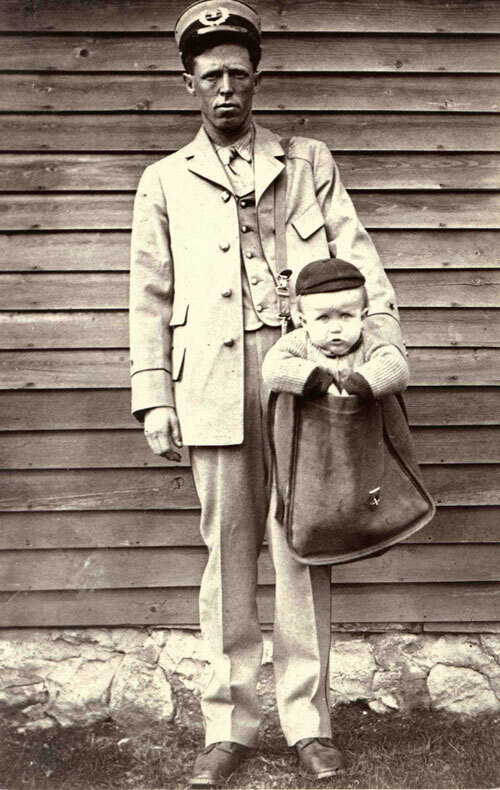 When parcel post first became available to Americans in 1913, we loved everything about it. Sending and receiving packages through the mail took the country by storm. We shipped and received live chickens, tobacco, and other items affordably and reliably. However, in some cases, children fell into the category of other items. While it was frowned upon, families who did not wish to pay the price of a train ticket could ship their tyke to their grandparents house, for example, for the cost of shipping a chicken- about 53 cents for a 50lb bird. In one instance, in Indiana, a postal carrier picked up a box that read “Live Infant” and was addressed to the baby’s father, who was divorced from it’s mother and lived across the state. Postage? 17 cents. Expression on the father’s face when he opened the box? Priceless. 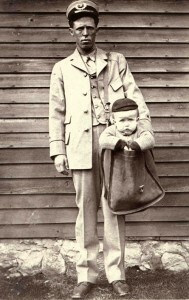 This practice continued throughout the early twentieth century until the United States Post Office declared it would no longer accept children in the mail.